When Ramon Mejía learned about an anti-Islam demonstration in Houston last year, he organized a counterprotest — but he said he didn't get the idea from a Russian Facebook page. Last week, federal lawmakers made public that two Russian Facebook pages organized dueling rallies in front of the Islamic Da'wah Center in Houston. One ad from the Russian-controlled Heart of Texas Facebook group announced a May 21, 2016, rally to "Stop Islamification of Texas," while another Russian-sponsored account announced a "Save Islamic Knowledge" counterprotest. Counterprotesters say their presence wasn’t influenced by the Russian Facebook ad but by the white supremacists who said they would attend. Hannah Bonner, a United Methodist pastor who attended the counterprotest, said there’s a community in Houston that’s now accustomed to responding to similar events led by hate groups. The protesters at the Da'wah Center had already been active and organized before the Heart of Texas ad. Mejía said he was especially moved to organize when he saw a White Lives Matter leader in Houston, Ken Reed, was going to attend the anti-Islam protest. According to the Anti-Defamation League, Reed is the executive director of a small but established neo-Nazi group in Houston called the Aryan Renaissance Society. 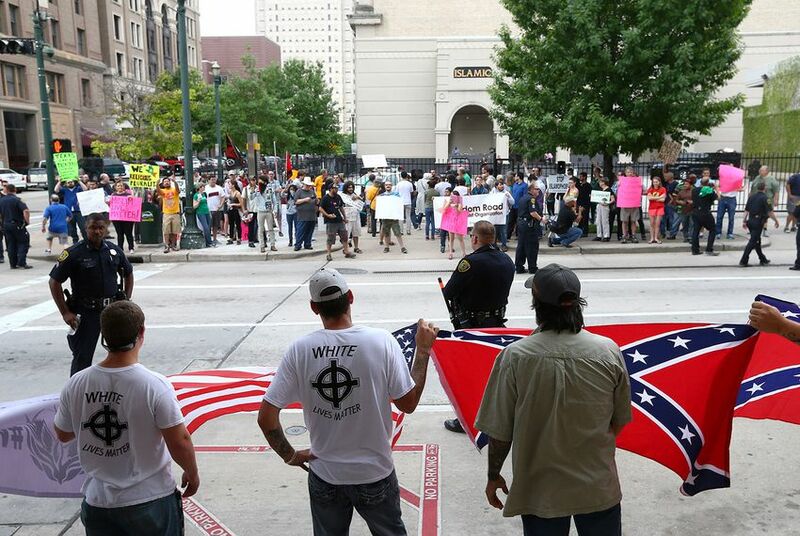 He’s led similar White Lives Matter events in 2016 outside the Houston NAACP, at the Texas Capitol and outside the Anti-Defamation League office. "This is the only instance we know of where extremists were actually motivated to show up to a 'Russian' event," Mark Pitcavage, an Anti-Defamation League expert on right-wing extremism, said in a direct message on Twitter. “This is America. We have the right to speak out and protest, and that’s what we’re doing. We feel that Texas, our great state, and the United States is being threatened by the influx of Islam,” Reed said, according to the report. Attempts to reach Reed and other White Lives Matter organizers were not immediately successful. Steven Orozco, another demonstrator at the anti-hate rally, called the Russian strategy for inflaming racial tensions "smart and brilliant." “If that’s what happened, kudos to Russia for pulling off something that’s honestly easy to detect," Orozco said. "As far as racism in the United States, in that case it’s a very effective tool."